I’m so happy to finally share my first sewing project for our future baby with you! I’m not planning on decorate a room into a nursery. First, because we only have a 3 bedrooms house and second because I did decorate, paint, made blinds for both of my first children…and they prefer to sleep together! My son doesn’t care about sleeping into a girly pink room (you can see some pics HERE if you like too). I still wanted to do something special for the baby. And, as a crafter, it means MAKE something! 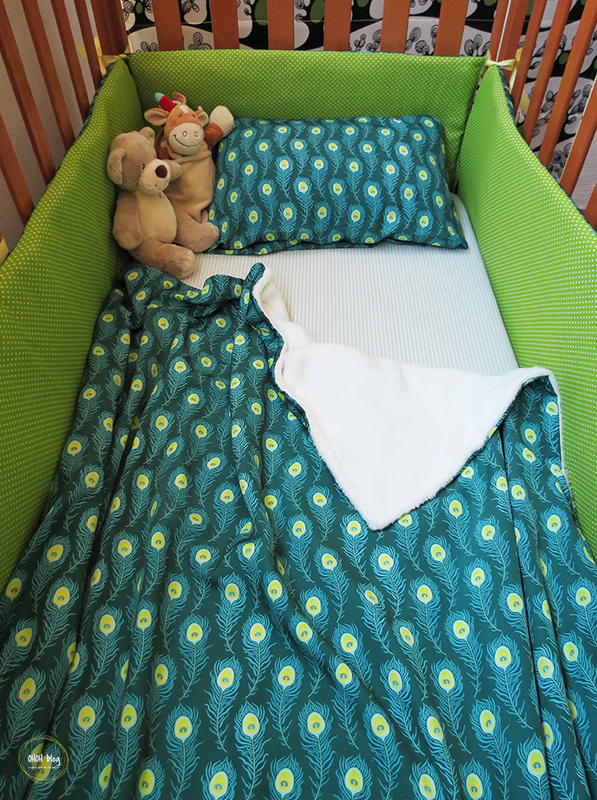 A new crib bedding was the perfect project. Beside sewing them, I also made the peacock feather design! Which make the bumper and the blanket even more special and personal! 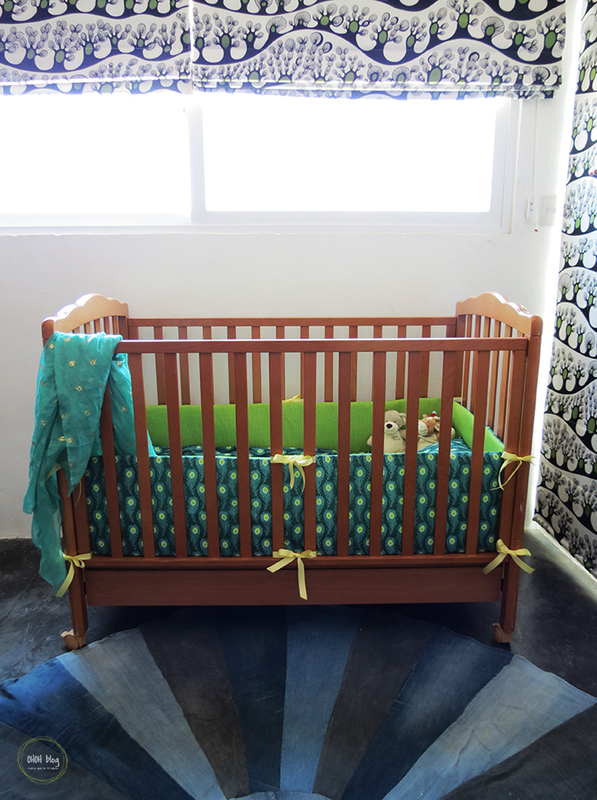 I was able to create this unique crib bedding thanks to Contrado! Those guys are amazing! 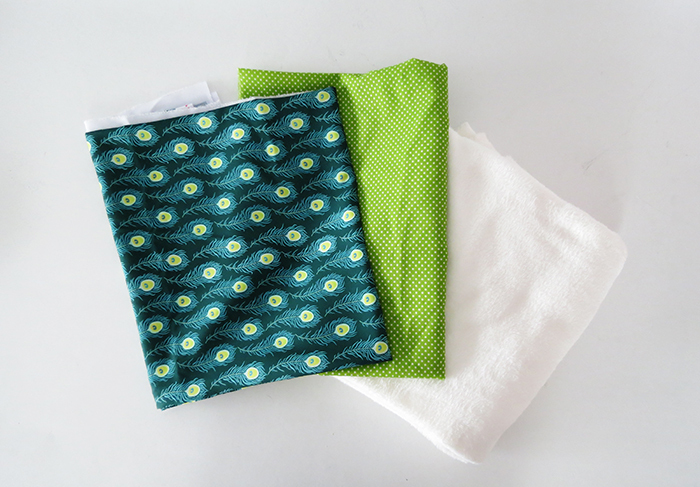 They can print any design on (almost) any kind of fabric, so if you are looking to create your own fabric pattern, I will definitely recommend them. The design and the colors were exactly what I was expecting and the delivery was fast (which is quite exceptional considering I live in Mexico and delivery services use to be quite hazardous). I love that my baby will have a unique crib bedding, sewn and designed by her mom! I was lucky enough to find a matching polka dots fabric for the inside of the bumper. I also get some white fleece fabric to make a cute blanket. Beside fabric you will need ribbon, matching thread and wadding. The first thing you need to do is taking the crib inside dimensions. Our is 120 cm x 60 cm (47 in. x 24 in.) To make the bumper I used 2 m of fabric (2 yards). 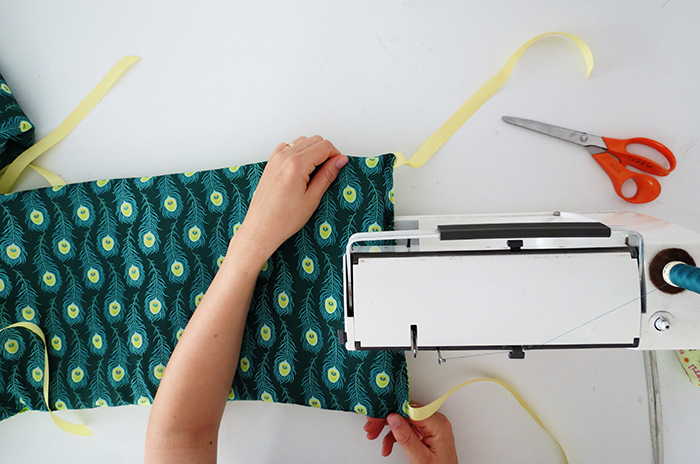 You need to cut 4 rectangles in the outside fabric. All rectangles will have the same high of 33cm /13 inches. The first 2 rectangles must have the lenght of the crib + 1 1/2 inch or 4cm. The other 2 rectangles must have the width of the crib + 1 1/2 in. or 4cm. My crib dimensions are 120cm x 60 cm. So I will have 2 big fabric rectangles of 124 x 33 cm and 2 small rectangles of 64 x 33 cm. Then you have to cut 4 identical rectangles in the inside fabric. 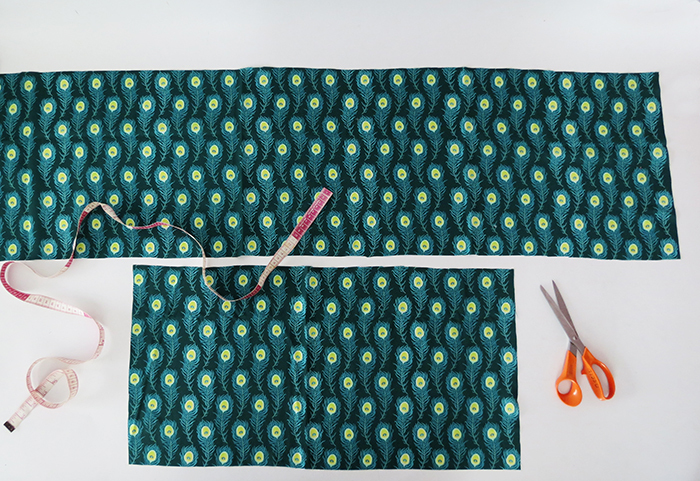 So you will end up with 4 long rectangles and 4 short rectangles (2 in each fabric). My crib dimensions are 47in X 24in. short rectangles (2 in each fabric). Place two small rectangles on top of each other, right side inward. Pin the edges together. Cut 4 pieces of ribbon of approximately 40 cm / 15 in. Put one on each corner between each fabric layer and pin. 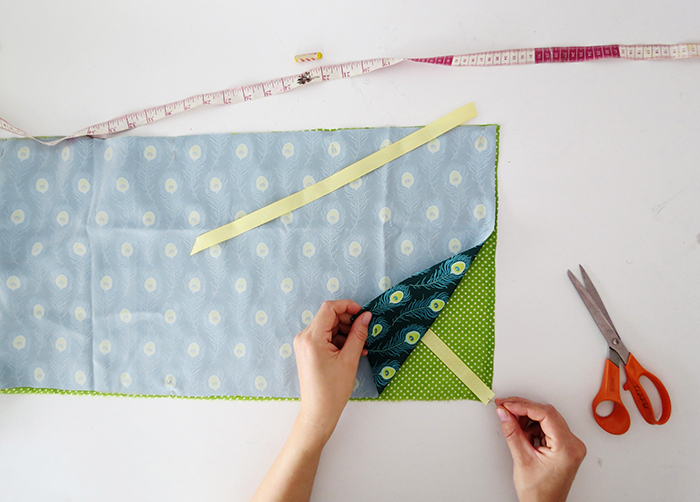 Sew the edges on 3 sides, leave one of the small side open. Repeat to make a second small bumper. 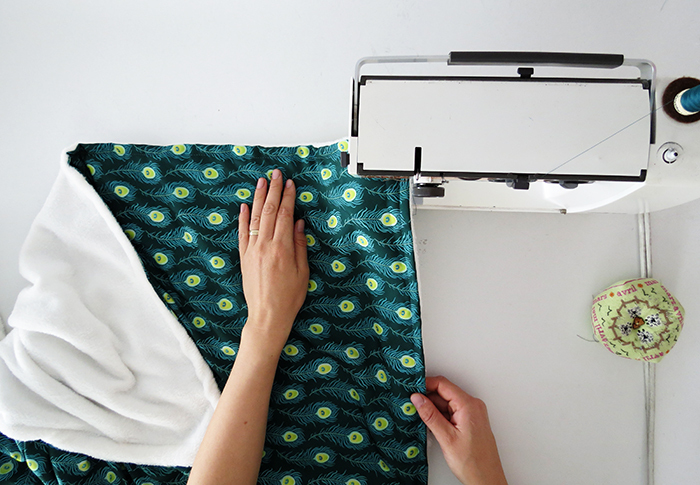 You can repeat the exact same process to sew the long bumper. You will just add two extra ribbon in the center. Cut 2 ribbon pieces of 80 cm / 30 in. 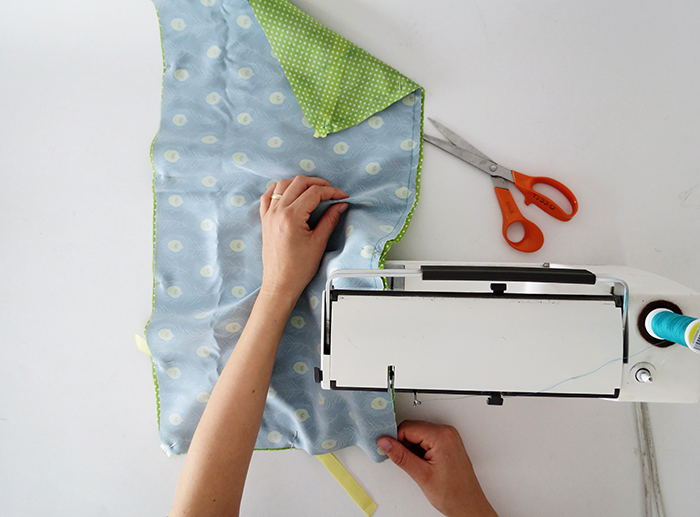 Fold them in the middle and place them between the fabric layers on the center of the rectangles. 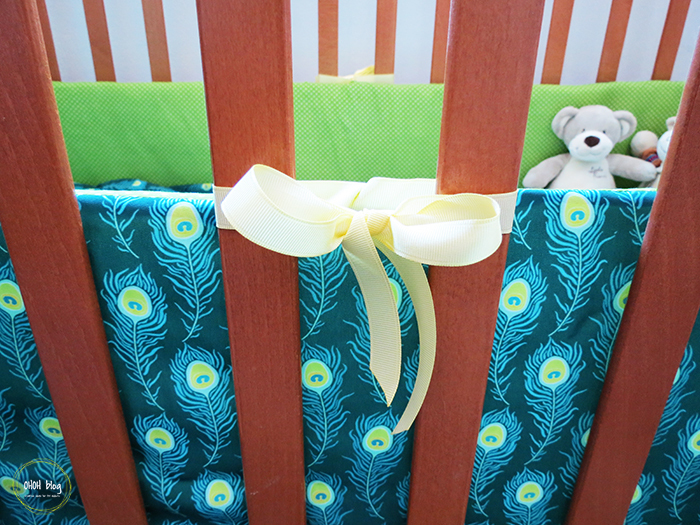 Those ribbons will allow you to attach the bumper to the crib and prevent it from bending. 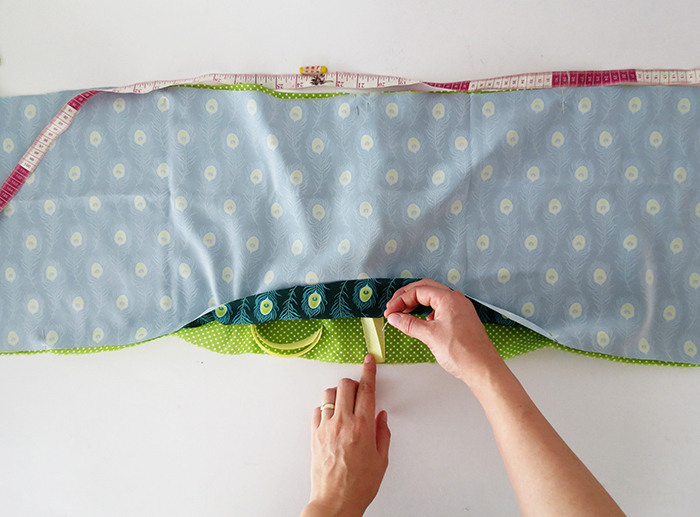 Turn your fabric rectangles right side out. Cut wadding foam at the same dimension as the rectangles and fill them with the foam. 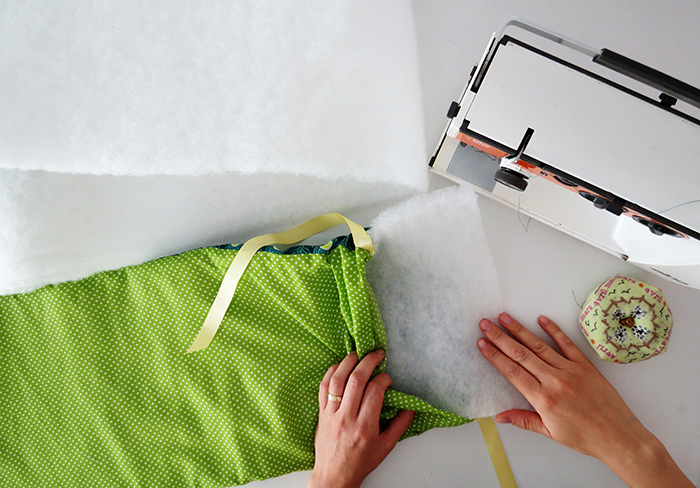 Fold the edges through the inside, pin and sew. 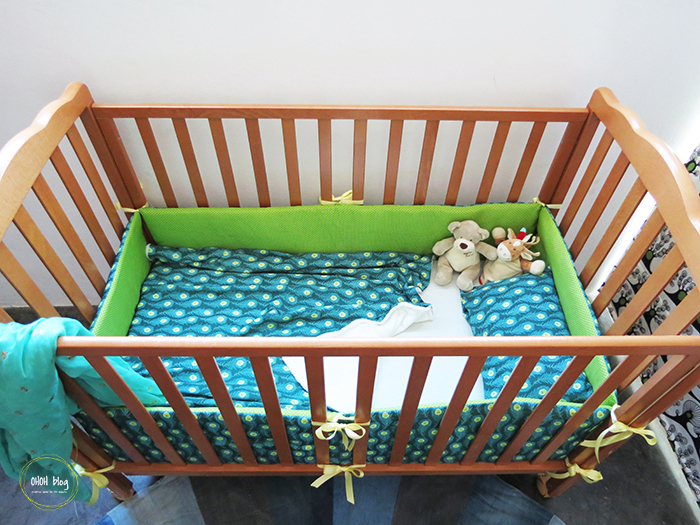 Once your four rectangles are filled with foam and closed, you can attach them on the crib making pretty knots with the ribbons. Let’s start the baby blanket. I choose to make a big one, you can reduce the size if you want it for a new born. Cut a square of 1m x 1m (1 ft x 1 ft) in the fabric and one in the fleece. 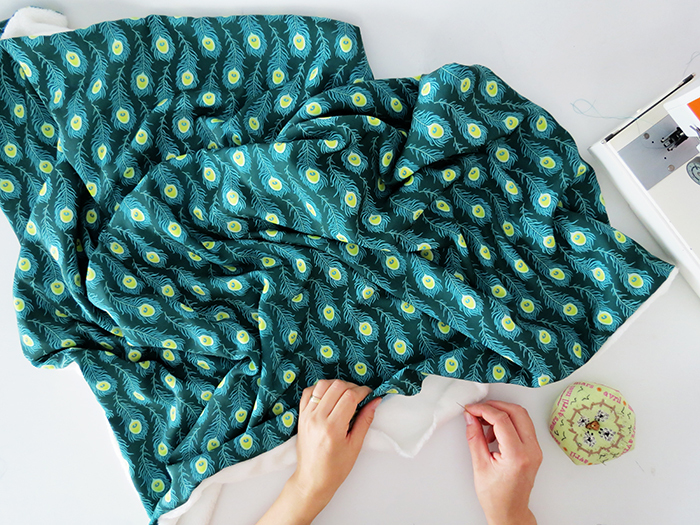 Place the fabrics on top of each other, right side inward. Pin the edges and sew them together, leaving and unsewn gap of 20 cm / 10 in. Turn the right side out, pin the opening and make a few hand stitches to close it. 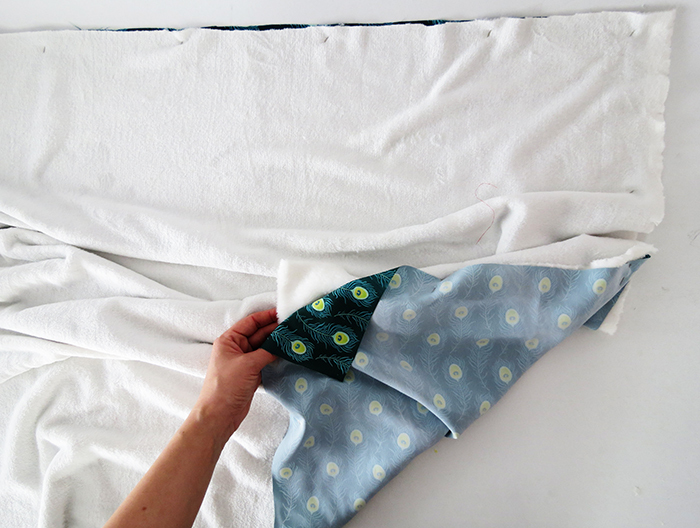 Make an extra seam on all the blanket perimeter, at more or less 1cm (1/2 in.) from the edges. And done, your pretty and very soft blanket id ready for baby! 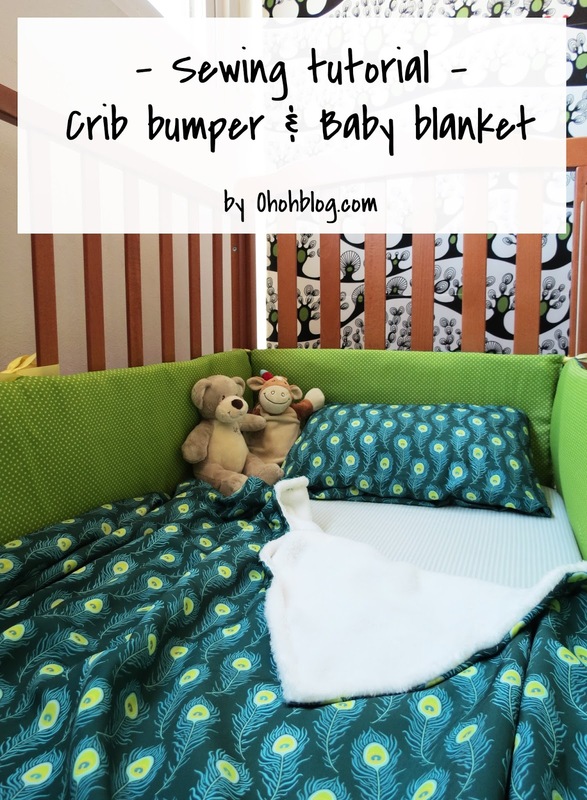 A lovely little crib for our future baby! 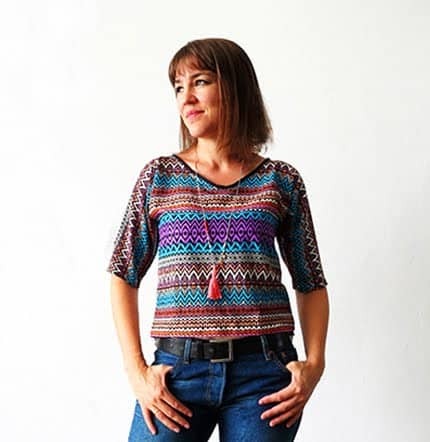 The tutorial to upcycling our old denims into a rug is HERE. Thank you again Contrado to help me create this stunning fabric design! Hello Katie, thanks for your comment! What I did with my other children, is taking off the side parts of the bumper until my babies turned 3 months old. When they grow they start moving more and having bumper is very useful! So I putted the full bumper back in the crib. I really like and appreciate your work. The points you have mentioned in this article are useful. It looks pretty good.